We work closely with our customers on product customisation, problem solving and product development. Our goal is to deliver stable and finished processes directly to the customer’s production facility. Our design department has great knowledge, a high level of technical skills and experience working with efficient and modern software, which creates the best conditions for the customer to ultimately obtain products that are well-suited in terms of functionality, performance, economy and design. All construction is conducted in our Parasolid-based system TopSolid, and we can accommodate all existing export file formats in 3D and 2D. In addition to precision moulding tools, we also design and manufacture special machines for assembly equipment and peripherals. 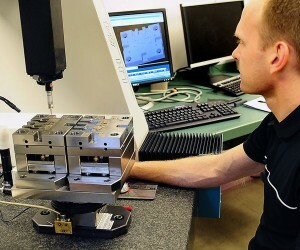 We use advanced CAD, CAM and simulation programs to support production. The modern machine fleet is largely integrated into the internal network, where the flow is monitored and managed continuously. Production parts made with tools from Tingverken are included in many advanced applications and systems around the world in the fields of Telecommunications, Electronics, Medical technology and Precision mechanics. Tingverken has skilled employees with great experience in handling customer-specific solutions.